What connections do you hope to achieve in six months? A year? Two years? What will it be like to get a note from the you of “now” in the future? Everyone … do the time warp! Write a Connected Letter with FutureMe. Want an additional challenge? 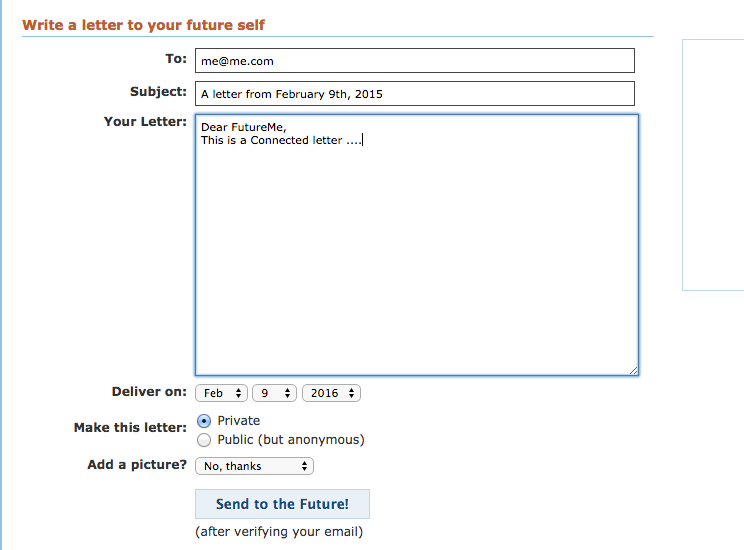 Write a note to the future to someone else in your network (if you know their email). Thanks to Terry for sharing this one out via Twitter. most of my reblogs go to the Adjunctiverse (humming “all of my exes live in Texas” as I write), not without it’s own need to connect better — within and without. The latter means jumping some arbitrary boundaries — transgression, literally — and getting back to local and other interest blogging. Besides this looks like fun. I may reblog to my blog based online ESL study group too for a writing exercise.